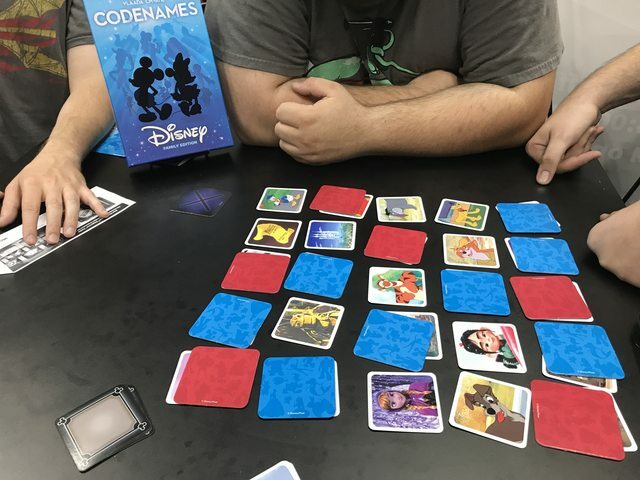 One of the games that I wanted to try out was Codenames: Disney, since I really like Disney. I managed to find the USAopoly booth and play a demo! It was basically like Codenames: Pictures with screenshots of Disney movies, which was a little disappointing, since I was hoping for stylized or silhouette art. On the other sides of the cards were words, so you could play pictures or words. Even though I was a little disappointed, I still kinda wanted to buy it, but it doesn't come out till October, so my wallet was saved! 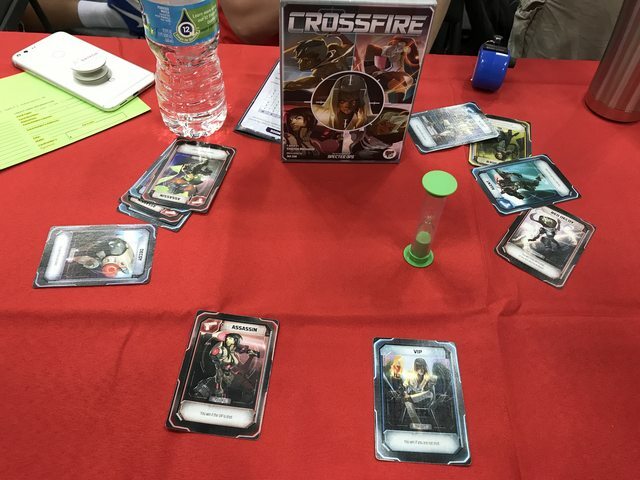 Another demo that I had really wanted to try out was Crossfire, a new social deduction game. Each person gets to see a few cards that are mixed up between the people around them, so you know that one of those few people are that role you saw. Then you have 3 minutes to discuss before everyone shoots someone. I really liked it, and I think this will definitely replace One Night Ultimate Werewolf, since it's a similar type of game (social deduction in ~5 minutes), but you have more information, and your role doesn't change. Unfortunately, it was sold out so we didn't get to buy a copy. Crossfire! You'll get caught up in the Crossfire! We also tried out the Gen Con library, which was in Lucas Oil Stadium. We had to pay $6 worth of generic tickets to get in, and we were a little disappointed in the selection, so we ended up only playing one game there. But we finally got to try out the first Spiel des Jahres winner, Hare & Tortoise (Amazon)! It's a racing game, but you get to choose how many spaces you move each turn (but you need to eat more carrots if you move more spaces). 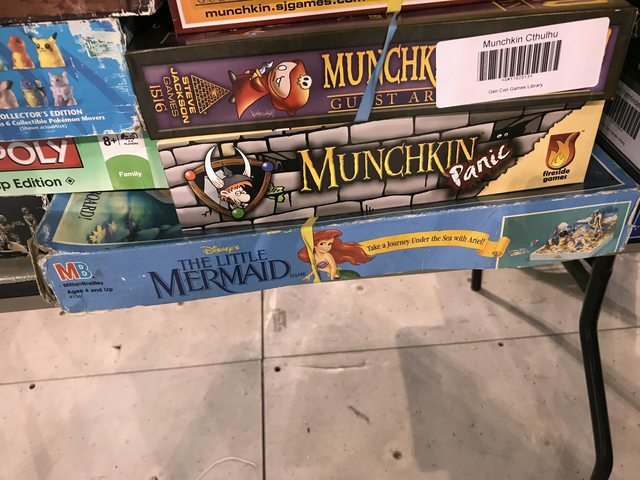 There were a lot of older games in the Gen Con library, and I was really excited to see my favorite game from when I was ~3-4: The Little Mermaid! 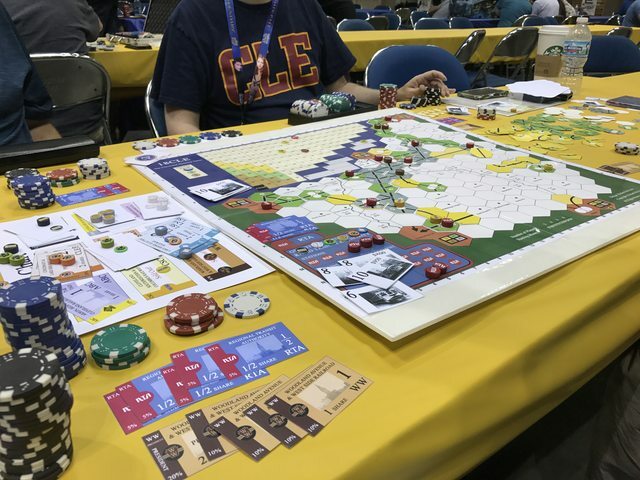 We only played one 18xx game at Gen Con - 18CLE. We bought an event ticket to play on Saturday, and we ended up playing a 4 player game with Richard, the designer. This was a very interesting and unique 18xx game! Instead of being worried about having to buy a train, the corporations would get acquired by the RTA corporation, so you had to plan around when/if you wanted your corporation acquired. I ended up starting two new companies just to give money over to my first company before they got acquired, so my first company got really good! Toby ended up losing two of his companies to RTA because Richard bought a 6 train, causing Toby's trains to rust before he could save them! We enjoyed the game and ended up buying it! Although Gen Con seems to be mostly focused around buying new games, the games we bought other than 18CLE were Oink Games. 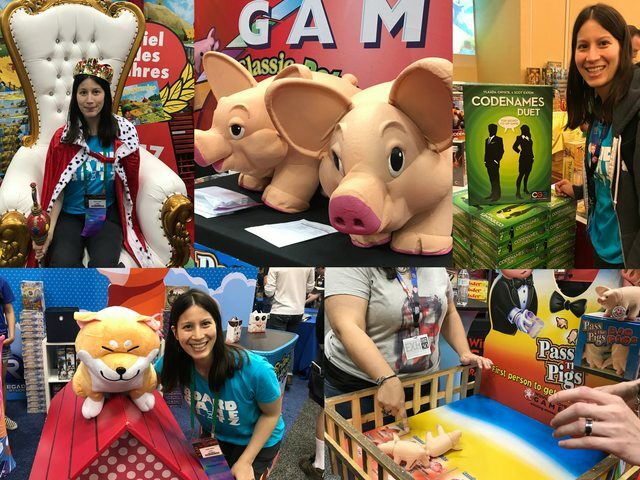 One of the first booths we went to on Thursday was the Oink Games booth, and after demoing a couple games, we ended up buying four of their games - Deep Sea Adventure (Amazon), The Pyramid's Deadline (Amazon), Twins, and Kobayakawa. We ended up playing The Pyramid's Deadline a few times during the convention too! It's a pretty interesting puzzle game where you're trying to build the best complete pyramid before time runs out, and you get the pieces by drafting dice. 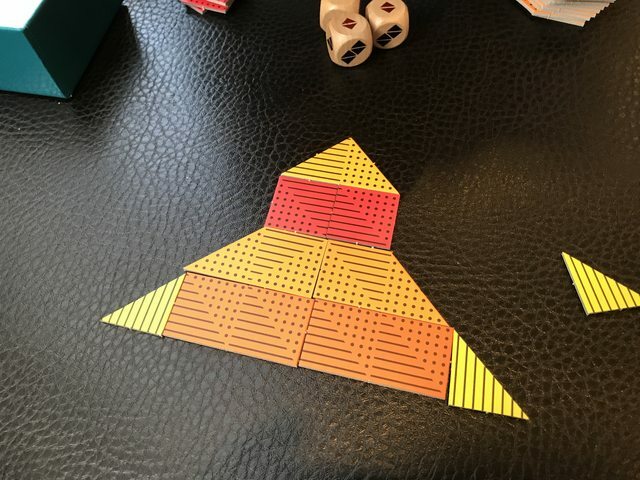 But there are specific rules for what determines a complete pyramid, so sometimes it's hard to finish, and you just get 0 points! Another cool thing about Gen Con was that there were a bunch of giant versions of games. We saw a giant Robo Rally being played with working robots! There were also some giant photo opportunities in the exhibit hall - a Kingdomino throne and a Shiba Inu dog on a house! And there was a section in the main game hall with some giant games being played (like Catan). And then there were side rooms where publishers were demoing their games, and in the CGE room we saw giant versions of Adrenaline and Codenames Duet! I'm not sure why you'd need a giant version of that... We ended up getting a giant version of Pass the Pigs (Amazon)! My coworkers love playing Pass the Pigs, so when I saw the giant version being played, I knew I had to get it. But apparently they were only available as a prize, so I went on Saturday morning to demo one of the Winning Moves games and won the giant pigs as a prize! 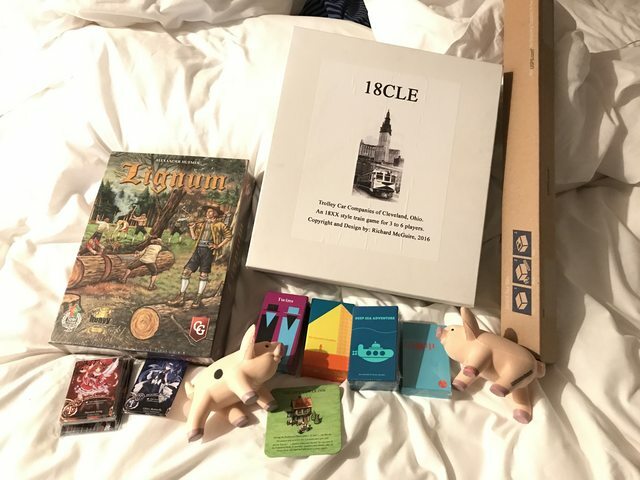 We went to a couple ticketed events throughout the convention (I already mentioned the BGG Hot Games room and 18CLE above), True Dungeon and the Dice Tower Live Show. 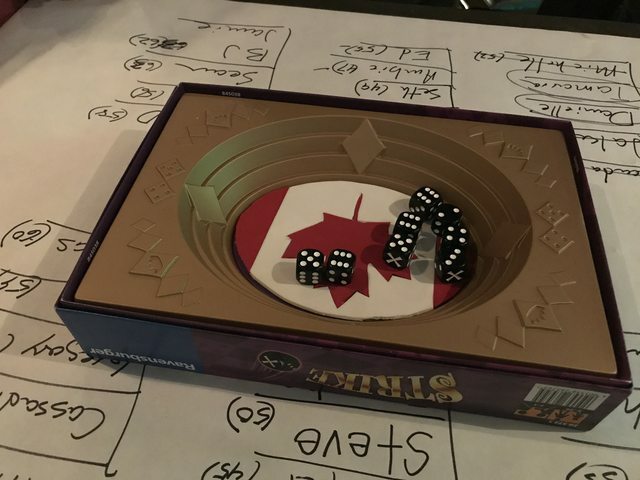 We also went to some podcast meetups to hang out - Ding & Dent, Rolling Dice & Taking Names, and The Secret Cabal. True Dungeon is a real-life RPG type game where you and a group of people are going through a dungeon solving puzzles and fighting monsters. The combat system is kind of like shuffleboard - your weapons are pucks that you slide, and you have to land in certain areas to do damage to the monsters. For spellcasters, they had to memorize certain symbols in order to effectively cast spells (the DM would quiz them when they were casting). I was a Bard, so my ability was singing to boost everyone's attack, but I also could do lore checks on the monsters. To do that, there were ~25-30 symbols I had to memorize the names of, and the DM would ask me what one of the symbols was. If I got it right, then I'd find out something about the monster (like its weakness). The first one I got wrong, but the next 4 I got correct, which was pretty exciting! But overall, the puzzles weren't great, and the combat got repetitive, so the experience wasn't as great as I had hoped. Since I've been to a lot of Escape Rooms, I was comparing True Dungeon to that, and in my experience, Escape Rooms are cheaper, have better puzzles and decorations, and are less repetitive. 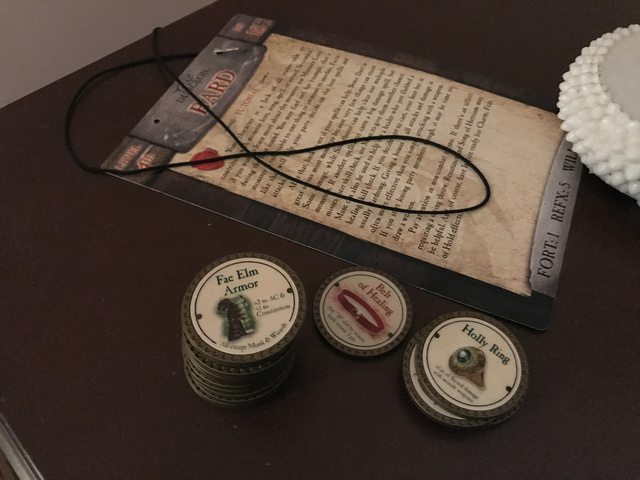 But a big part of True Dungeon is the collectible aspect - all your equipment is represented by tokens, and the tokens are collectible. We ended up selling our tokens since we're not planning on doing True Dungeon again, but I could see the appeal. We had a lot of fun at the different podcast meetups, and we got to meet a lot of people! One of the highlights of the meetups was the Rolling Dice & Taking Names (RDTN) Strike (Amazon) tournament. If you aren't familiar with the story, the two hosts of RDTN, Marty and Tony, have had a disagreement on the "theme" of the game Strike. Tony says that it's Gladiators in an Arena, and Marty thinks it's just Dice in a Bowl. So they had a tournament to decide once and for all what it is. About 60 people signed up, split into team Arena and team Bowl, and there were 3 rounds for the tournament. Toby and I ended up on team Arena (I originally was thinking about going to team Dice in a Bowl, since I actually think it's Dice in an Arena, but when we arrived, there were about 10 more people on team Bowl than team Arena, so I wanted to balance it out). In the first game, Toby got first and I got 2nd, so we both advanced. Then Toby got first again, so he advanced to the finals! And then he won the finals!! It was really exciting! Toby ended up winning a copy of Strike and Lignum! Also, because Toby won, Marty lost and had to wear a squirrel suit the next day (see this thread on BGG for details). By far the most crowded part of Gen Con is the Exhibit Hall. There were hundreds of vendors at Gen Con, and a huge room in the convention center was dedicated to them. We could walk around all day looking at new games, accessories, art, geeky decorations and stuffed animals, cosplay items... It was really fun to just look around and window shop. And there were also demos at a bunch of the booths. I already mentioned the games we demoed, but there were so many more games to see. 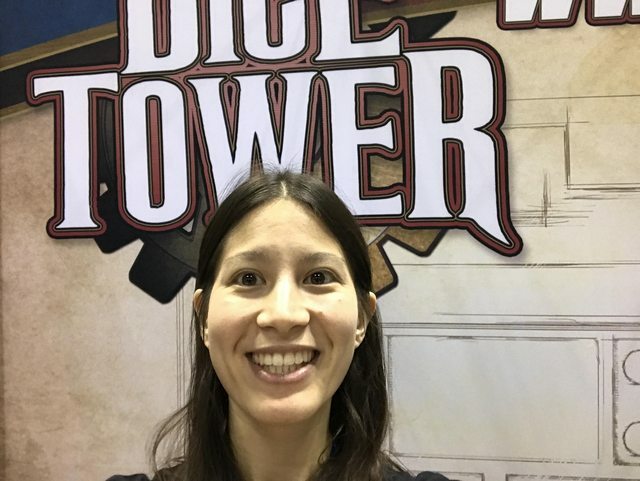 I also got to help out at The Dice Tower booth a couple times, selling the promos and saying hi to people. That was pretty fun - my dream job as a kid was a cashier, so I actually liked counting up the totals and getting change for people. Also, I got to meet a lot of people who like Board Game Blitz! It was super exciting when people came up and said they like our podcast or my videos! Cassadi gave me some Board Game Blitz badge ribbons, and I was able to give a few out to people. If you stopped by to say hi, it was great meeting you! This was my first time working at a booth! Food was okay. I had expected all the food trucks to be good since I've never really been to a bad food truck, but we tried a few of them and were disappointed in the prices and quality of food. So on Friday and Saturday, we ended up going out to eat. I had never been to or even seen a Steak 'n Shake before (I don't think there are many on the west coast), so we went for dinner on Friday. It was actually pretty good (if you're in the mood for unhealthy burgers and shakes). It was also very cheap - only $4 for a burger! I can see how it'd be a great food stop for college kids. 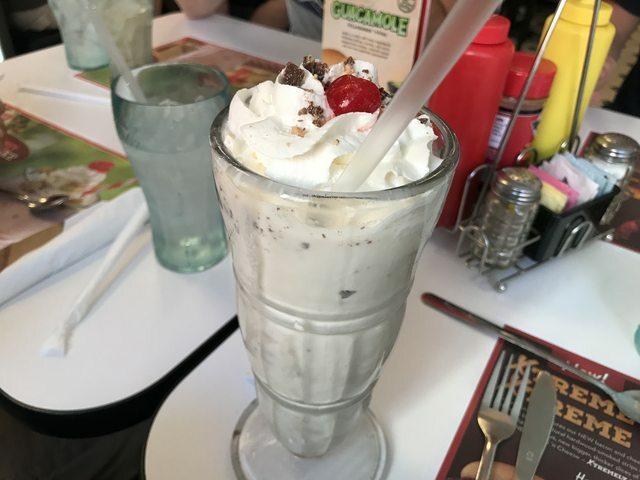 Mmm... peanut butter cup shake! On Saturday we decided to go to Fogo de Chao right when it opened. Fogo de Chao is an all you can eat Brazilian steakhouse. Basically the waiters go around cutting you slices of meat off of skewers until you get full. Some of the meats were good, but the majority were not as good as expected. At least the cheesy bread was good though! There were so many other things at Gen Con. A lot of people were cosplaying, and there was a cosplay contest on Saturday (I didn't see it, but throughout the convention we walked by a lot of cosplayers, and there was even a section dedicated for cosplay photos). 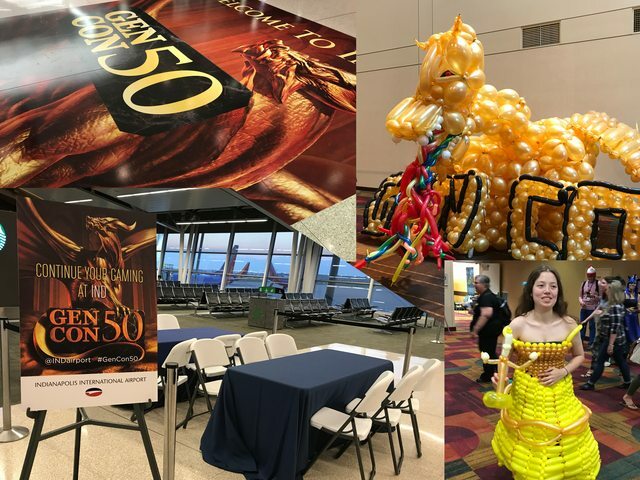 There were also a lot of creative exhibits in the main halls - huge card houses built out of Magic cards, a collaborative Gen Con painting, and a huge Gen Con dragon made out of balloons! And the balloon artist also made a Belle dress for someone as cosplay! There was so much to see at Gen Con, and it was really exciting going to such a big convention. 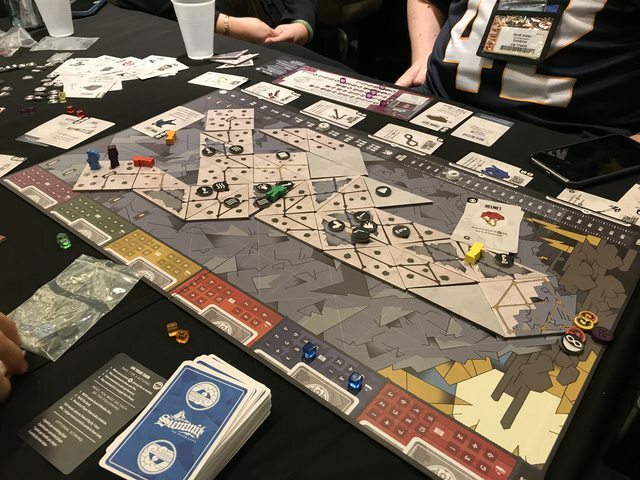 Another thing that I've never experienced at a board game convention before is that the entire city knew about it. When we got to the airport, there was a sign for Gen Con on the tile floor. All the restaurants and Uber drivers knew we were there for Gen Con. There were even tables at the airport to continue gaming when we left Gen Con! 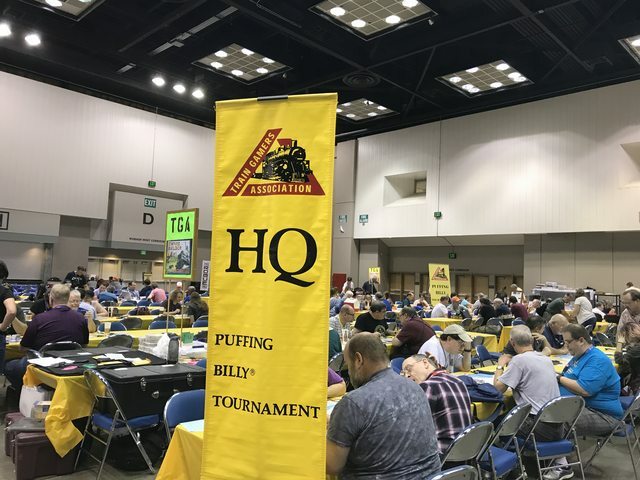 Overall, I had a great experience at Gen Con. Although it's definitely not my type of convention (I hate crowds and lines and I don't really buy a bunch of new games), I still had a fun time meeting a bunch of people and experiencing the convention. And even though we don't usually buy many new games, we still got a decent haul! Our Gen Con haul! A few of the games were prizes!